Discussion in 'African Cichlid Identification' started by Nebraska_cichlids, Sep 16, 2011. Hi! I got two wild-caught additions to the fish room that trace back to Oliver Lucanus' shop. The pictures aren't great but I didn't want to delay the transfer into the tanks. As for the top picture, Anton Lamboj, Mark Smith, and I (and obviously Oliver) agree that it is Steatocranus sp. Bulk Head. 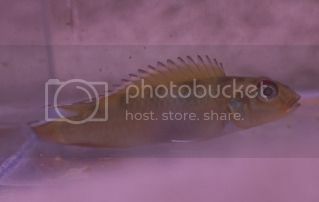 The fish in the bottom picture was sold as Nanochromis consortus or Nanochromis splendens. I have not yet shared this pic with anybody. What do you think? Thanks Rod. I hope you don't mind me saying this, but I disagree with your ID. 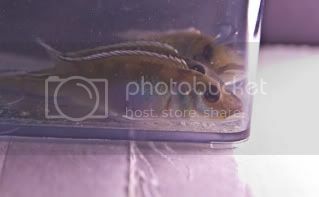 If you see the fish "live" it clearly is a species of Steatocranus. 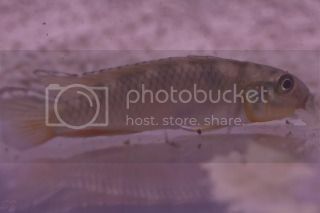 The pic is a little misleading and one can easily mistakeit is Orthochromis sp. -- I give you that. As I said, Anton, Mark, Oliver, and I all agree this is S. sp. Bulky Head. I will try to get some better pictures soon, now that the fish are in their tanks and started coloring up. That might help. As for the Nanochromis, I heard back from Anton this morning. He thinks they might be parilus, but he's not 100% sure. Wouldn't be the end of the world, other than that I would have twice as much as I should have. I'm still hopeful it's something different because Oliver is selling both parilus and this species and probably would have noticed if they were the same species. Also, I have kept parilus before and they looked different than what I got here. I'm open to suggestions, though. My first guess is parilus as well-and that was before reading that that is what Anton said. Better pictures are needed though! An open tail shot of the female(s) as well as shots of the male(s) would help greatly. No doubt there is a strong resemblence compared with parilus. I'll try to get better pictures. I'll also gpo ahead and contact Oliver to see if he has additional information. N. parilus has two different tail patterns. Maybe he just separate them out as two different Nanochromis. You might be right. On the other hand, it was because of the tail coloration, why Anton suggested it might be parilus. (Anton has seen a second picture that I haven't posted here.) The trio spent all day in hiding, i.e., new and hopefully better pictures will have to wait. should have been consortus./splendens, but it could be that Kevin picked the fish from the wrong tank...sorry about that. I have some parilus here that are different from the normal parilus, maybe he confused the two, they are right next to each other. I am in Costa Rica at the moment, so i can not confirm until i am back in October, remind me next time, i will get you the right fish. So, perhaps more info to post in October. 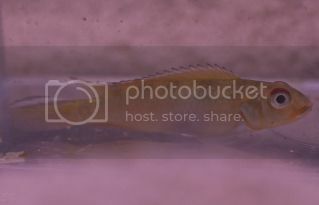 Wow that photo of N.splendens on the AMNH website sure doesn't look like anything I've ever seen in the hobby under that name. 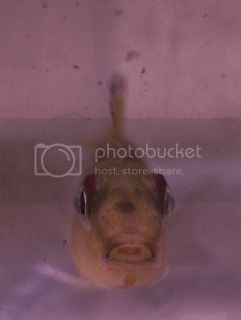 Can anyone point me to a photo of a REAL LIVE N. nudiceps ? Been wondering for decades what nudiceps really is. Seems funny that N.minor remains in Nanochromis while dimidiatus got moved to the new genus Congochromis (Stiassny & Schliewen 2007). I would have guessed those two were sister-species based just on general similarity. There is a good image of nudiceps on planetcatfish.com -- looks similar to what Anton shows for nudiceps in his book on W. Africans. I finally got the replacement fish for the Nanochromis that were mislabeled as "splendens" last fall. This time it could be the real thing. What do you think? Nice teugelsei! Not splendens though, sorry. Let's hope not. The fish look very different than my teugelsi. Plenty of orange an yellow coloration. They trace back to Oliver lucanus and I have confidence in the guy. I'll email the images to Anton to find out what he thinks. The tail pattern screams teugelsi. 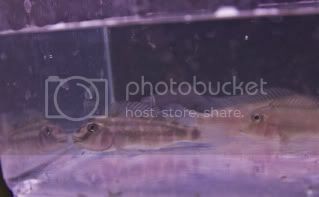 After having about 100 wild teugelsi go through my fish room I've seen a fair amount of variation on the fish. I still hold to the idea that the fish discribed as splendens is really just the more colorful tail pattern form of parilus. Take a look at pg 161 in the English version of Anton's book. The top picture shows a male of the more colorful tail pattern form with the red and blue bars on the lower part of the tail and the yellow/white and black stripes in the upper. Then look at the picture of the preserved splendens at the bottom of the page. Same tail pattern! It would explain why no one can seem to find the "real" splendens out there! I'll happily take my thought back once someone comes up with a live splendens but I really think that either the fish discribed as splendens is just the more colorful form of parilus OR someone screwed up and submitted a more colorful form of splendens as the preserved specieman and we will never really now what the fish that was discribed as splendens is. But hopefully I'm wrong! Janos, do you know if Anton has seen/worked with any preserved speciemans of splendens other then the one pictured? I look forward to Anton's I.D. of your fish and hope for the best! I believe that Anton is vacationing the first half of this month, and we'll have to wait a few more days to get his opinion. He once told me that he used to keep splendens, if I recall correctly. I work with the German version of Anton's book, which unfortunately has only a picture of the preserved specimen. I will definitely let you know what anton has to say. There are a couple of videos on youtube, depicting splendens (or whatever the Id might be). I believe they were posted by a guy overseas. I have discussed the ID with Mark Smith and his opinion is "definitely not teugelsi, but not sure about the true ID." If you ever travel through Nebraska again, you are most welcome to stop by at my place again and take look at the live fish yourself. This is what Oliver had to say about the colection site: "The fish are collected somewhere along the way from Kinshasa to Mbandaka, 2 hrs upstream from the big saw mill." Before hearing back from Oliver regarding the collection site, i heard from Anton. He is leaning toward teugelsit, but would like to see more pics once the fish are larger. Some photos is missing as you see, any support with that would be great! This species register is open and free for all. We want to support the hobby in best possible way!